Florida Vegetable Gardening Guide — Revised! Vegetable gardening offers fresh air, sunshine, exercise, enjoyment, mental therapy, nutritious fresh vegetables, and economic savings, as well as many other benefits. 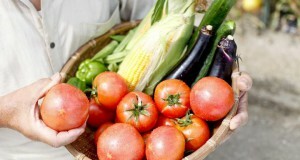 With some attention to planning and planting, vegetables can be grown year-round in Florida. This 11-page guide provides recommendations primarily for traditional home gardens, including planning your garden and choosing crops, soil preparation and maintenance, fertilization, irrigation, pest management, and other gardening know-how. Includes a planting guide, table of suggested varieties, and table of products labeled for insect and mite management in home vegetable gardens. Written by Sydney Park Brown, Danielle Treadwell, J. M. Stephens, and Susan Webb, and published by the Environmental Horticulture Department.